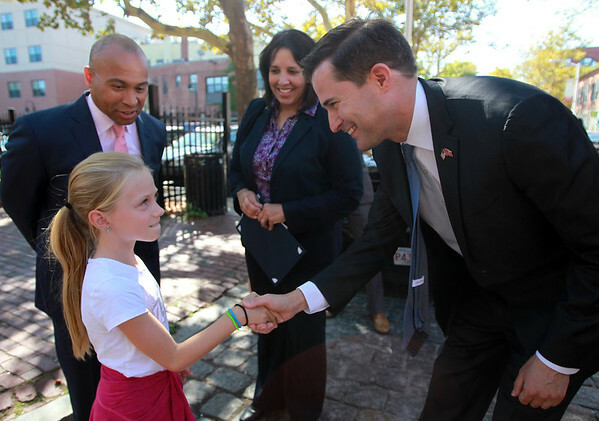 Democratic congressional candidate Seth Moulton, right, shakes hands with nine-year-old Ava Middleton, of Beverly, as Massachusetts Governor Deval Patrick, and Salem Mayor Kim Driscoll look on. Both Driscoll and Patrick endorsed Moulton in his upcoming election against Republican candidate Richard Tisei, on Friday afternoon in Derby Square. DAVID LE/Staff photo. 9/12/14.